Grease two baking trays with butter and place a parchment paper. Meanwhile, preheat the oven at 180°C for 15 minutes. Sieve the flour, corn flour, salt, baking powder, and place aside. Beat the egg whites separately until they begin to slowly form soft peaks. Now add the cream of tartar and beat until they reach the stage of soft peaks. Mash the bananas and strawberries separately using a hand blender. Place aside. Beat the egg yolks separately until soft and fluffy. Add sugar into the egg yolk mixture and beat again until they blend well with each other. After that, add milk and beat again until they combine nicely. Add vanilla essence (only for banana sponge). Separate the mixture into two and mix well. Add in the mashed bananas and strawberries into the above mixture in 2 separate parts and beat until the mixture incorporates well with each other. Add sieved dry ingredients in batches of three. In a large bowl, beat the shortening and butter with an electric mixer until light and fluffy. Add in vanilla and beat again until smooth. Gradually add sugar, one cup at a time, beat well on medium speed. Continually scrape the sides of the bowl to mix them well. When all sugar has been mixed in the icing will appear dry. For thin (spreading) consistency icing, add 2 tablespoons light corn syrup, water or milk. For pure white icing (stiff consistency), omit butter; substitute an additional 1/2 cup shortening for butter and add 1/2 teaspoon of no-colour butter flavour. Beat the egg yolk with 75g sugar until sabayon consistency is reached. Boil the cream with 50g sugar and add the sabayon to it. Switch off the flame and fold gently using a spatula. Put it aside and let it cool. Once the mixture gets cool, add the soaked gelatin sheets. Whip the cream until stiff peaks form. Add almond extract and fold all together. Set in desired shapes and chill. Melt white chocolate and mix with crushed cornflakes and set as a filletone sheet. Melt chocolate and mix with boiled cream for ganache. 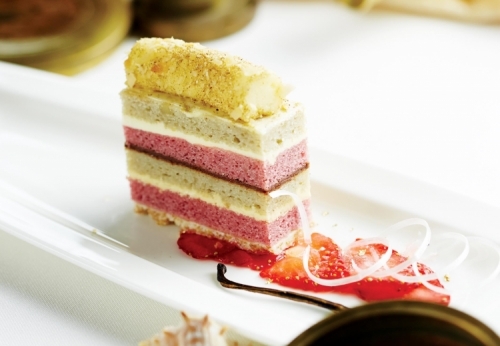 Keep the filletone sheet as a base, spread a thin layer of butter cream and arrange a layer of strawberry sponge, spread peanut butter and a layer of banana sponge. Repeat the above step twice to form a tower. For plating, layer the sliced strawberries at the bottom, put on the tower cake, place the mousse on top and then garnish with a vanilla pod. Sprinkle with gold leaves and dust for final touch.